This week, the Sagittarius New Moon on Tuesday, 29 November infuses us with fresh energies for candid communication and opportunities for enhanced collaboration. Sagittarius is one zodiac sign that’s always up for new ideas and grand schemes, so fire away – just take note of Neptune’s close square at this time. Neptune rules imagination and creativity, but can lead us into distraction: remember to stay grounded and focused, and it’s all good. LEFT: THE EMPRESS REVERSED. When The Empress appears upside-down, it’s time to re-evaluate what you cherish in life, and how you show it. Could you be clinging on to something that no longer serves your highest good? Or have you been neglecting a situation that really deserves more TLC – like your health or a relationship, for instance? The Empress is the mother figure of the Tarot, and her topsy-turvy presence indicates either a lack of care or a lack of respect for boundaries. MIDDLE: TEN OF SWORDS. Ooof. When this uncomfortable-looking card appears, a crisis is imminent; if you’re currently facing (or about to face) a difficult situation, look back to the reversed Empress for some clues as to how you got here, and how you can move forward. One nice thing I’ll say about this card, though: it’s not likely things can get much worse. Still, don’t let Neptune delude you into throwing an emo pity-party. Put the black eyeliner away; use the New Moon energies to get your act together and arise once more. You can do this. RIGHT: KING OF SWORDS. 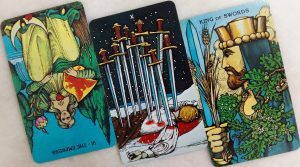 This Week’s Tarot advises us to be like the King of Swords in dealing with our challenges – calmly, with rational thinking and clear, structured dialogue. In the Tarot, the suit of Swords represents logic, communication, and the power of mind over matter. This is a time to reach out and speak up for yourself, with people you can trust. Seek guidance where it is needed – someone in your life who’s known for his/her calm and rational instincts may prove to be of help. Above all, stay focused: keep your wits about you, think before you speak, and don’t be swayed by emotional extremes. You’re going to be just fine. Hang in there. Have a wonderful week ahead!